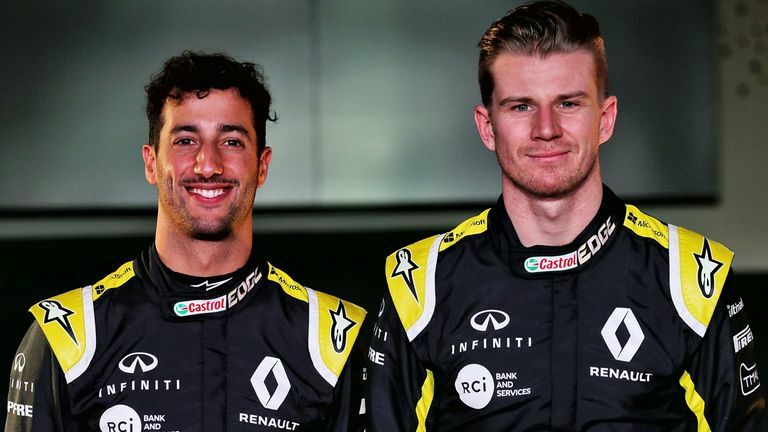 Sky Sports’ Craig Slater and James Galloway deliver their verdict on Renault’s F1 2019 launch and what they’ve seen so far during ‘launch week’. There was one word which was used above all others at Renault's season launch: momentum. Principally, maintaining the consistent level of championship improvement which has taken the Enstone team from ninth, to sixth and then fourth in the three seasons since the French manufacturer returned to team ownership. Closing the gap to Mercedes, Ferrari and Red Bull is the number one target for year four of the project. "We knew that it would take some time to come back on the podium. We know that we still have a gap with the front runners," said Renault Sport president Jerome Stoll. "But we are investing massively and for 2019 it's just about keeping the momentum of the improvement. We don't know what's going to be the final position at the end. Fourth is the minimum, but how far from the top teams? As close as possible." Where will the improvement come from? While 2019's aerodynamic rule changes have naturally been the topic of much focus in the lead up to the new season, engine performance is going to remain a key differentiator for teams. Renault have lagged behind Mercedes and Ferrari in this regard in the hybrid turbo era, but there was optimism at the launch that a corner may have finally been turned. "We've had the best winter of the last five years," declared engine chief Remi Taffin. What's different on the F1 2019 cars? Team boss Cyril Abiteboul talked about achieving "engine excellence" and revealed fresh investment was being pumped into their engine base in France to create a new dyno and workshop fit for the next decade. "The engine looks promising in terms of performance," concurred executive director Marcin Budkowski. Will Renault be ready for testing? The race is on at Renault to deliver the RS19 in time for the first of the two pre-season tests, which starts on Monday in Barcelona. The car revealed this Tuesday carried only a few 2019 parts. Just moments before the wraps came off what was essentially the 2018 car with a new livery and a 2019 front-wing, Abiteboul admitted the RS19 was "in bits" in the factory. Time is pressing. Budkowski admitted it was "tight" to get the car fit for next week's test while Abiteboul shied away from guaranteeing his team would be ready for Barcelona. Daniel Ricciardo is excited about driving for his new team Renault but admits a 2019 win is unlikely. 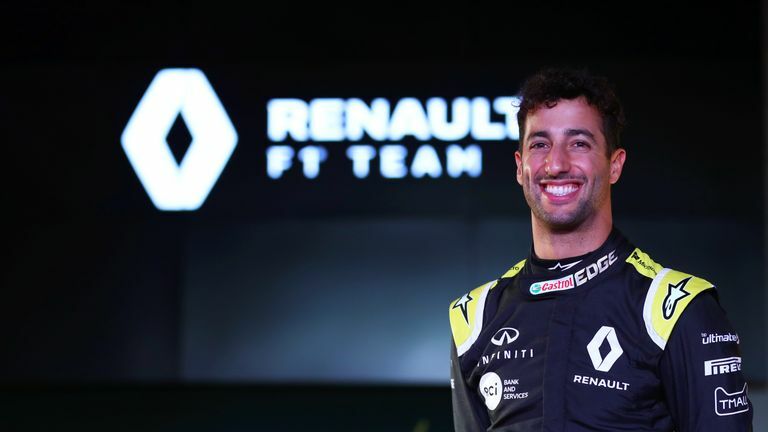 Renault showed off their big new winter signing for the first time and Daniel Ricciardo, sporting his new yellow and black overalls, seemed at home in his new Enstone environment. He cracked some jokes, spoke optimistically about the future and perhaps gave his clearest explanation yet of that bombshell decision last summer to quit Red Bull for Renault. "The more I think about it I don't see it too much of a gamble," said Ricciardo. "We're not coming in saying 'we're going to win' so the expectation and the bar is initially not very high. Whereas at Red Bull every year we built ourselves up, because they'd won in the past, and felt it's going to happen. Watch every 2019 practice session, qualifying and race - only on Sky Sports F1. "The risk is being let down every year and if I stayed there the risk was it doesn't work again and with Honda maybe that doesn't happen. So the risk of failure is greater than coming here and having the risk of not winning. Out of the two options, they both have some risk but with risk comes reward and I feel that because the growth here is potentially a lot bigger, I feel the reward can certainly be bigger here." Ricciardo, who addressed the factory for the first time on Monday, said he already felt he was part of a team that wasn't content with just finishing fourth. "It's certainly not a midfield attitude it's like 'let's attack those top teams'." Nico Hulkenberg talks at the Renault launch about his aspirations for the season. 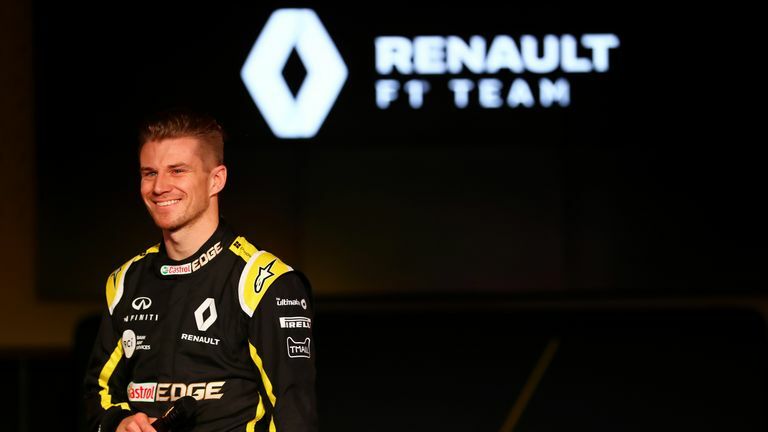 He's seen off Jolyon Palmer and Carlos Sainz in his first two years at Renault, but Nico Hulkenberg readily admitted at the launch that the arrival of Ricciardo as his team-mate is a significant moment in his career. "It's an important and big year in a way that I now have a team-mate who is a proven grand prix winner," said Hulkenberg. "It was sort of like that with Rubens [Barrichello, at Williams in 2010] but it was different. It was my rookie season and he was in something like his 18th season, so it wasn't a good or fair comparison. "This is much more real and good to compare. So for me personally a very important year to see how I step up next to that. That will obviously also determine my sporting future in a way." When's Australian GP repeats on Sky? IndyCar on Sky Sports F1 in 2019! Analysis: Who is ahead for Australia?